As you might know from last night’s live blog, Stage Rush was reporting from the press room of the 2010 Tony Awards. After they gave their acceptance speeches, most of the night’s lucky winners made the long journey from Radio City Music Hall across the rainy plaza of Rockefeller Center to the LA Sports Club, where the press room was stationed. (We missed you, Scarlett Johansson and Catherine Zeta-Jones!) Among the Tony winners were Denzel Washington, Viola Davis, Katie Finneran, Levi Kreis, and the Memphis creative team. Here are the highlights from those interviews. Are you excited for the Tony Awards, Rushers? What category are you looking forward to most? What do you think is the tightest race? Check out my predictions for who will win on the big night (and who should win), and tune into Stage Rush for the live blog of the Tony Awards this Sunday, starting at 7 p.m.! 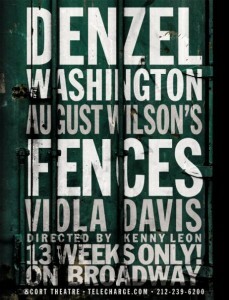 The way Fences transported me to another world is the way that all plays should. And I was standing for the entire performance. With a standing-room ticket (because that’s the only way to get into this show without breaking the bank), Denzel Washington, Viola Davis, Santo Loquasto’s set, and Brian MacDevitt’s lighting pulled me into 1957 Pittsburg. The night felt like an event. You could chalk it up to the massive Hollywood-star wattage displayed on stage, and you’d be right. The way the audience of the Cort Theatre was buzzing is what Stage Rush is all about—people getting an adrenaline rush from theater. It wasn’t just Washington and Davis’ presence that made it an event though—it was the quality of the piece on display, and the acting chops and production value to match it.